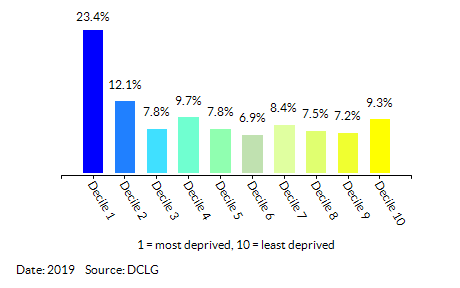 Poverty and deprivation aren’t just economic issues – they limit opportunities and prospects for children and young people, damage quality of life for families and harm long-term health and life expectancy. 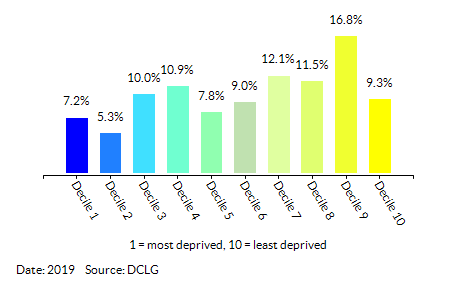 Below are some key statistics relating to poverty and deprivation in Cumbria. To view these key statistics for smaller areas within the county (i.e. districts, electoral divisions, wards and LSOAs) please click on the ‘Maps’ and ‘Profiles’ options above and for more detailed briefings, summaries, resources, data sources, key documents and useful links, please visit our Further Information page. 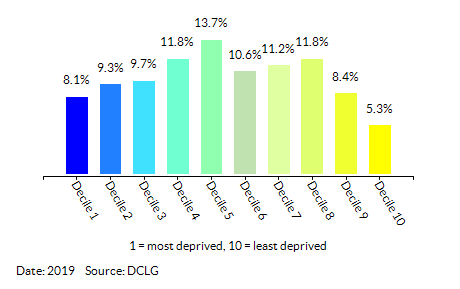 The Index of Multiple Deprivation (IMD) combines information from seven domains to produce an overall relative measure of deprivation. The domains are: Income; Employment; Education; Skills and Training; Health and Disability; Crime; Barriers to Housing Services; Living Environment. Each domain is given a weighting and is based on a basket of indicators. 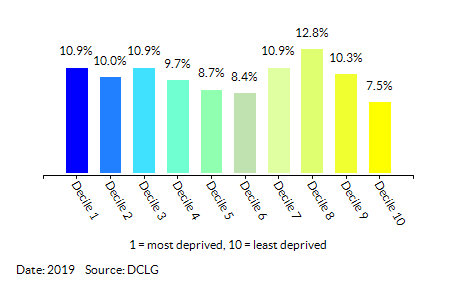 The Income Deprivation Domain measures the proportion of the population in an area experiencing deprivation relating to low income. The definition of low income used includes both those people that are out-of-work, and those that are in work but who have low earnings(and who satisfy therespective means tests). 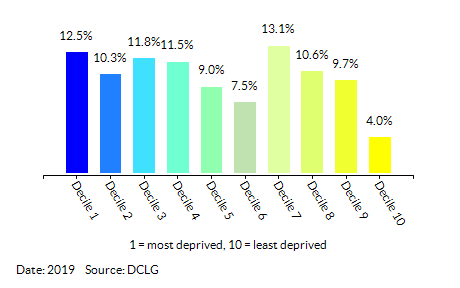 The Employment Deprivation measures the proportion of the working-age population in an area involuntarily excluded from the labour market. This includes people who would like to work but are unable to do so due to unemployment, sickness or disability, or caring responsibilities. The Education, Skills and Training Domain measures the lack of attainment and skills in the local population. The indicators fall into two sub-domains: one relating to children and young people and one relating to adult skills. These two sub-domains are designed to reflect the 'flow' and 'stock' of educational disadvantage within an area respectively. 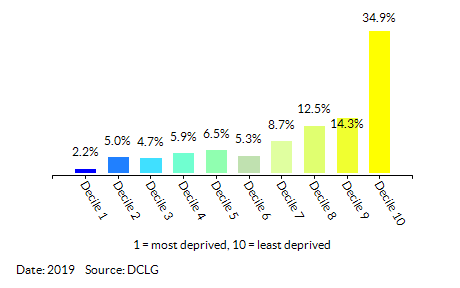 The Health Deprivation and Disability Domain measures the risk of premature death and the impairment of quality of life through poor physical and mental health. 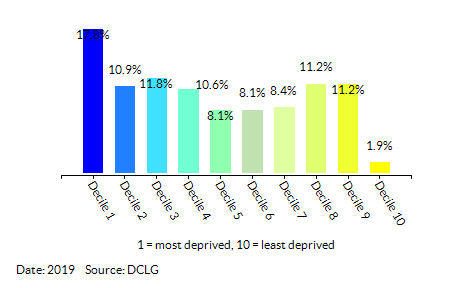 The domain measures morbidity, disability and premature mortality but not aspects of behaviour or environment that may be predictive of future health deprivation. The Barriers to Housing and Services Domain measures the physical and financial accessibility of housing and local services. The indicators fall into two sub-domains: 'geographical barriers', which relate to the physical proximity of local services, and 'wider barriers'which includes issues relating to access to housing such as affordability. The Living Environment Deprivation Domain measures the quality of the local environment. The indicators fall into two sub-domains. The 'indoors' living environment measures the quality of housing; while the 'outdoors' living environment contains measures of air quality and road traffic accidents. This is the number of children living in families in receipt of Child Tax Credit whose reported income is less than 60% of the median income, or in receipt of either Income Support or Income-Based Jobseekers Allowance as a percentage of the number of children in families receiving Child Benefit. These statistics are based on a snapshot of several data sources on a specified day (usually 31st August). The data used comes from administrative databases on benefits and tax credits held by the Department of Work and Pensions and Her Majesty's Revenue and Customs. The statistics are based on the finalised awards tax credits data – that is, they are based on a finalised view of family incomes and circumstances - and as such are derived from a full set of administrative records rather than a sample. 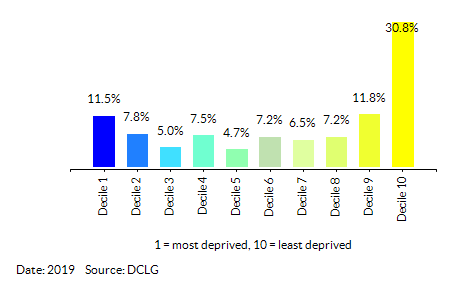 These are households where at least one parent or guardian claimed one or more of the following out-of-work benefits: Jobseeker’s Allowance, Income Support, Employment and Support Allowance, Incapacity Benefit/Severe Disablement Allowance, Pension Credit or Universal Credit at 31 May of the relevant year. A claimant may be in receipt of a combination of any of these benefits.